Management of lesional epilepsy is one of the most gratifying and fruitful areas in clinical neurosciences. In particular, patients with focal cortical dysplasia (FCD)—a histopathologically-distinct entity that has been recognized for nearly 50 years—are very amenable to excellent outcomes following neurosurgical intervention. In this issue, Chaturvedi and colleagues report their experience in 52 patients with drug-resistant epilepsy secondary to histopathologically-confirmed FCD. The authors provide a detailed account of the clinical presentation, seizure profile, results of their exhaustive presurgical work-up including electrographic data (with invasive intracranial monitoring in selected cases), neuroimaging findings, magnetic source localization, neuropsychological evaluation, as well as surgical outcomes data. Moreover, the authors are to be commended on their analysis of quality of life (QOL) data, as assessed by a validated tool (QOLIE-89). As is expected from an experienced and dedicated team of clinicians and neuroscientists, the seizure freedom rates in this cohort of 52 subjects is excellent with a large majority of patients achieving Engel Class Ia outcome after surgery. Not surprisingly, the authors noted a significant (nearly 50%) improvement in QOL scores following resection of the epileptic tissue. Over the last 10 years, there have been hundreds of papers reporting on the surgical outcome following excision of areas of FCD in patients with intractable epilepsy. Distinctively, the report by the group from National Institute of Mental Health and Neurosciences (NIMHANS) is one of the few publications describing the multidisciplinary management of patients with FCDs from a developing country and the only such paper addressing QOL data in this patient population. Focal areas of cortical dysplasia have long been recognized as an underlying substrate for development of refractory seizures. The term “FCD” has been employed to encompass a wide spectrum of histopathologic abnormalities comprising disturbances of cortical lamination, cytoarchitectural lesions, and other underlying abnormalities of white matter. Over the years, our understanding of the pathobiology of FCD has evolved considerably. The classification system described by Palmini et al., in 2004 was widely used for many years. It distinguished FCDs histopathologically into 2 types: FCD Type I and FCD Type II with 2 subtypes in each category. Subsequently, the 2011 classification scheme proposed by a task force of the International League Against Epilepsy (ILAE) aimed at providing a more refined and reproducible clinicopathologic grading system to define FCDs with distinct clinical, electrographic, neuroimaging, outcome-related and molecular/genetic characteristics. The ILAE classification of FCDs rapidly gained favor and still remains the primary method to subdivide the different entities that fall within the continuum of FCDs [Table 1]. A large body of knowledge has been generated over the past decade. We know that FCDs can vary greatly in size and location, can occur in any part of the brain, and represent one of the most common causes of medically intractable focal epilepsy. These lesions develop in the early fetal development and knowledge of human embryonic and developmental neuroanatomy is helpful. The classic descriptive lesions in FCD Type I are dyslamination and disruption of the organization of the tissue architecture with presence of morphologically normal neuronal and glial populations. With this rearrangement of the cortical and tissue architecture without a disturbance of overall cellularity or grey matter density, the magnetic resonance imaging (MRI) findings are often absent or restricted to subtle blurring of the grey-white matter junction. FCD Type Ia consists of an abnormal radial (or columnar) cortical lamination and is the most well documented form of FCD. It is considered to represent a focal “maturational arrest” in cortical reorganization at mid-gestation (at around 22 weeks gestation). FCD Type Ib represents defective tangential (or horizontal) cortical lamination and is associated with lamina-specific loss of neurons. This pattern of FCD is less well recognized and remains somewhat controversial, and debate remains open as to whether this entity is a true subtype of FCD Type I.
FCD Type Ic is described when both radial and tangential aberrations are present in the six-layered cortical architecture. This FCD subtype is diagnosed only when present as an isolated abnormality and not when noted in combination with any other pathology. The underlying pathogenesis of FCD Type II is quite different from that of FCD Type I. The characteristic feature in FCD Type II is the presence of large, dysplastic, often megalocytic neurons intermixed with normal neurons. In FCD Type IIa, the hallmark findings include the presence of dysmorphic neurons with markedly enlarged nuclei and cell bodies along with accumulation of cytoplasmic neurofilament proteins. Differentiation of individual cortical layers is nearly impossible (except for layer 1) and dysmorphic neurons are distributed throughout the entire cortex and underlying white matter. This results in blurring of the grey-white matter junction histologically. In FCD Type IIb, the above findings are combined with presence of the prototypical “balloon cells” consisting of large multinucleated cells with abundant eosinophilic cytoplasm on hematoxylin and eosin stain. Balloon cells can be present in any cortical location and even in adjacent white matter. These unique cells are of mixed lineage and express both neuronal and glial proteins. Focal cortical areas of dyslamination (FCD Type I) can be (and often are) associated with other principal lesions usually adjacent to or affecting the same cortical region/lobe. Four variants are distinguished based on the associated abnormality. In FCD Type IIIa, there is concomitant hippocampal sclerosis and adjacent alteration of the architectural organization of the temporal neocortex. In FCD Type IIIb, the cortical dyslamination and aberrant cytoarchitecture of the neocortex is associated with adjacent indolent developmental glioneuronal tumors of the cortex, such as ganglioglioma and dysembryoplastic neuroepithelial tumor. In FCD Type IIIc, the alterations of cortical laminar and cytoarchitectural composition are noted adjacent to a vascular malformation such as cavernous malformation, arteriovenous malformation, telangiectasia, and leptomeningeal vascular malformation. The cortical architecture is often severely disturbed and contributes to the altered epileptic networks affecting the region. FCD Type IIId is defined when the cortical dyslamination is seen in conjunction with an associated primary lesion that is not otherwise classified in subtypes IIIa, b, or c. These can include prenatal or perinatal ischemic or hemorrhagic lesions, traumatic brain injuries, and inflammatory or infectious diseases including encephalitis. The presurgical work-up of patients with FCD Type II has been streamlined and with proper investigation and management, excellent long-term seizure outcomes are expected with surgical resection. Unfortunately, the same does not always hold true for FCD Type I. The results from the group at National Institute of Mental Health and Neurosciences, Bangalore, are in keeping with this general observation. These surgical failures, even with the use of invasive monitoring, are likely the result of a failure to adequately localize the epileptogenic zone and reflect the probable widespread epileptic pathology in patients with FCD Type I. Further refinement of the FCD classification system is needed and should incorporate recent descriptions of the molecular and genetic characteristics associated with FCDs. For example, several groups have reported that aberrations in the mTOR pathway associated genes are present in a subset of FCD Type II lesions. A future, comprehensive classification scheme of FCDs based on distinct clinical, electrographic, neuroimaging, histopathological and cytoarchitectural, as well as molecular-genetic data will not only help in our understanding of the underlying pathophysiology of FCDs but can also identify novel targeted treatments for refractory epilepsy due to FCDs. Chaturvedi J, Rao MB, Arivazhagan A, Sinha S, Mahadevan A, Chowdary RM, et al. Epilepsy surgery for focal cortical dysplasia (FCD): Seizure and quality of life (QOLIE-89) outcomes. Neurol India 2018;66:1655-66. Palmini A, Najm I, Avanzini G, Babb T, Guerrini R, Foldvary-Schaefer N, et al. 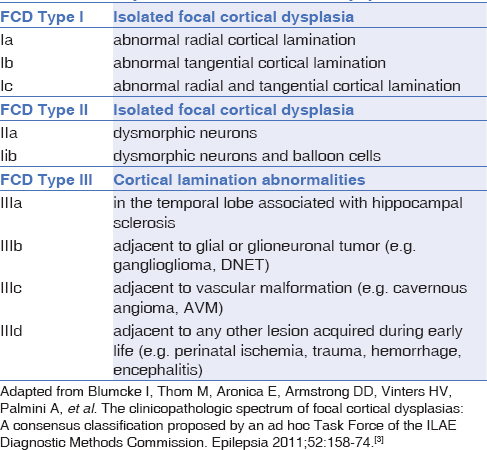 Terminology and classification of the cortical dysplasias. Neurology 2004;62:S2-8. Blumcke I, Thom M, Aronica E, Armstrong DD, Vinters HV, Palmini A, et al. The clinicopathologic spectrum of focal cortical dysplasias: a consensus classification proposed by an ad hoc Task Force of the ILAE Diagnostic Methods Commission. Epilepsia 2011;52:158-74. Najm IM, Sarnat HB, Blumcke I. The international consensus classification of Focal Cortical Dysplasia-a critical update 2018. Neuropathol Appl Neurobiol 2018;44:18-31.